The following are the general requirements for the garage gas water heater installation concerning its burner chamber height above the floor surface. Depending on the model / type / age of your particular water heater and your jurisdiction, they may or may not apply – always check before the installation. If there’s no manual explaining the garage gas water heater installation requirements, contact the manufacturer and ask for instructions for your particular model (in many cases you’ll be able to obtain it online). However, the rules listed below are extremely important. 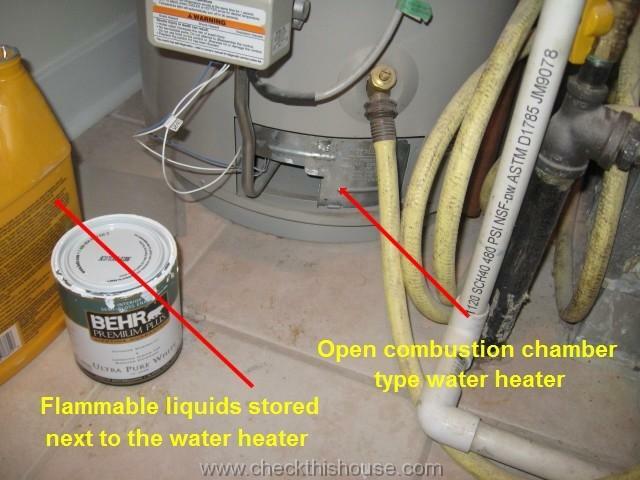 If they do apply to your garage gas water heater, you may be putting your life in danger by not following them. As a general requirement, you should not install a gas water heater in any location where gasoline, flammable vapors or liquids, and combustible materials are likely to be present. Such installation may result in an explosion or fire, but sometimes there may be no other choices. If this is where you’re standing right now, you must follow the garage gas water heater installation rules. 1. 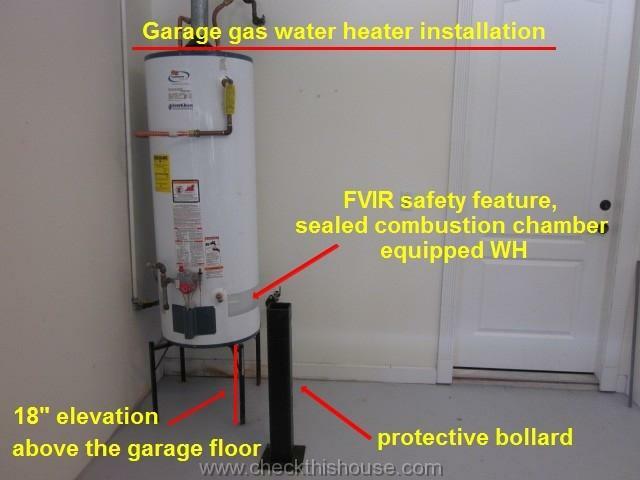 How high should the garage gas water heater be raised off of the floor? The free standing or attached garage gas water heater installation is one of those not-preferable locations, but sometimes it is the only one. Ignition source (pilot, electronic igniter, hot surface igniter, etc.) of the garage gas water heater must be 18″ from the floor surface. The same rule applies to the gas water heater that has been installed in a room opening to the garage, such as a utility closet, or utility room. This applies even if the door(s) separating the garage and the water heater room are air tight / self closing. 2. 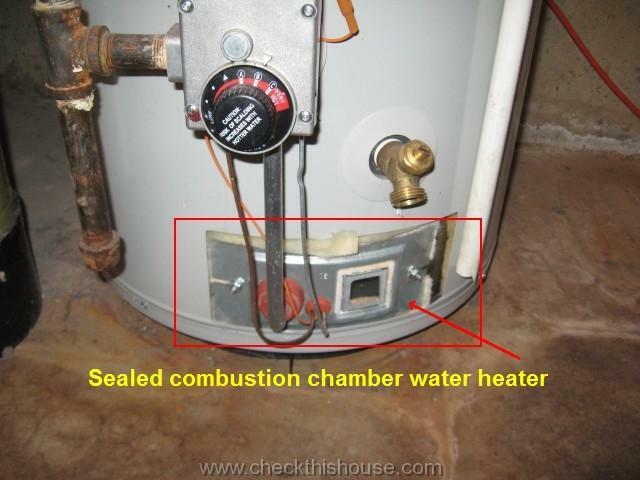 Water heater ignition source must be 18″ from the floor in an area where flammables are stored. 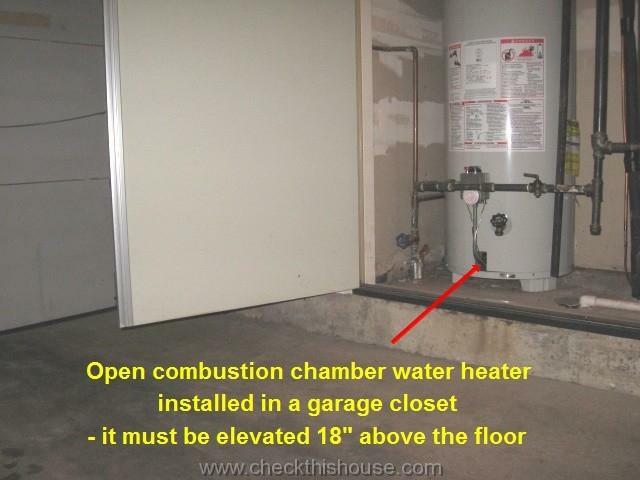 For the garage gas water heater and any area that is also dedicated to storing flammables, or if there’s a possibility of such materials being stored there, put the appliance on a platform so the ignition source is at least 18” above the floor surface. Make sure that this platform is capable of supporting the weight of the filled WH. The way it often works in our homes is that while looking for some storage space we stuff our utility room / closet with everything that doesn’t fit anywhere else. Things such as leftover paint, paint thinner, all kinds of cleaning chemicals, container filled with emergency gasoline, etc are usually found here. Is this how your water heater closet looks? Well, you’re not alone. Besides accidental spillage, some of those plastic containers may simply melt down while standing next to the water heater or on top of it, spilling its contents, and causing vapors to ignite underneath the water heater and inside the burner chamber – go and look around your WH base. Don’t push it to the side! Take it out of there! Bad news: most of the WH manufactured prior to 2003 had an open combustion chamber and they were not equipped with a safety device that would prevent vapor ignition. Effective July 1, 2003, all residential 30, 40, and 50 gallon atmospheric vent (natural draft) water heaters are required to be equipped with FVIR -flammable vapor ignition resistant design. July 1, 2006 – the same requirement has been applied to 30, 40, and 50 gallon power-vented residential gas water heaters with less than 75,000 BTU input. July 1, 2007 – water heater conversion to FVIR design has been extended to all residential water heaters with inputs of 75 000 BTU’s or less including Power Direct-Vent, Direct-Vent, Manufactured Housing and larger gallon capacity models not covered in the first two phases. 3. Elevation of the garage gas water heater above the floor is not required if the water heater is FVIR -flammable vapor ignition resistant. Theoretically, FVIR feature-equipped garage gas water heater could be installed without the previously required 18” elevation (wherever the flammables are stored). The new water heaters have a sealed combustion / burner chamber and a push-button igniter mounted on the exterior. Although they still draw the combustion air from the surrounding area, safeguards incorporated into this new design prevent gas or vapors ignited inside the chamber from escaping into the room. I said that “theoretically” you can skip the 18” elevation requirement, because manufacturers and some jurisdictions may still recommend (or require) that even garage gas water heaters equipped with FVIR are still installed 18 inches above the floor surface. Always read the manual and verify procedures with your local code enforcement division before the garage gas water heater installation… any water heater installation – it could save you time and money. Water heater requires a 3” pedestal (concrete, etc.) to minimize moisture infiltration / corrosion. It cannot be installed directly on-the-ground. For the garage gas water heater installations this would most likely apply to platform materials. Water heaters can be installed directly / without elevation on a combustible floor (unless otherwise specified in its manual or by your local jurisdiction), except on carpeting. If it must be installed on carpeting, you need to place a wood or metal panel beneath the water heater, extending at least 3” beyond its base in all directions. 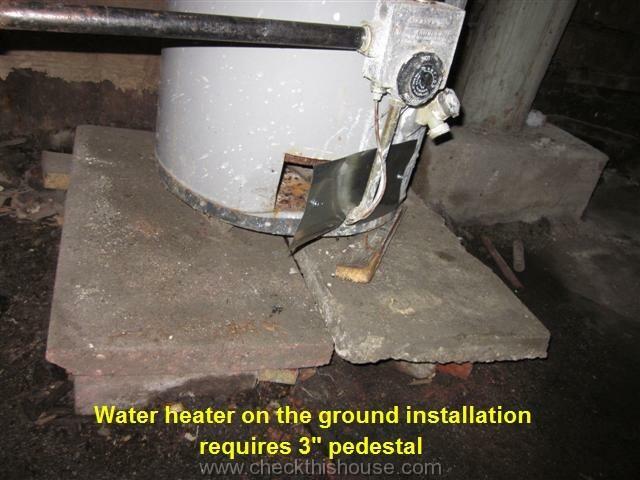 Some jurisdictions may require electric water heaters to be elevated above the garage floor as well. Because of the location of the lower heating element, an electric WH may have to be raised 10 to 12 inches off the floor – check first! 7. Water heater installed in the garage requires protective guards / bollards in order to prevent a car from driving into it. How about garage gas water heater maintenance… it will extend its life span and make your life safer. That covers the basics of the garage gas water heater installation concerning its burner chamber height above the floor surface.